So we were going to go apple picking this weekend but Hurricane Joaquin had other plans. Luckily I was still able to get my hands on some good local apples at the super market without all the mud and decided to dedicate this week to all things apple. I know it’s tempting just to go the pie or apple sauce route if you have a lot of them, but there are so many more ways to use apples. This week I will walk through 3 totally different recipes that really show the apple’s range. This first dish is inspired by a terrific tapa at a Spanish restaurant called Jaleo, here in DC. It’s been on their menu for years and while I haven’t been able to get it 100% perfect, this is pretty close to the real thing. 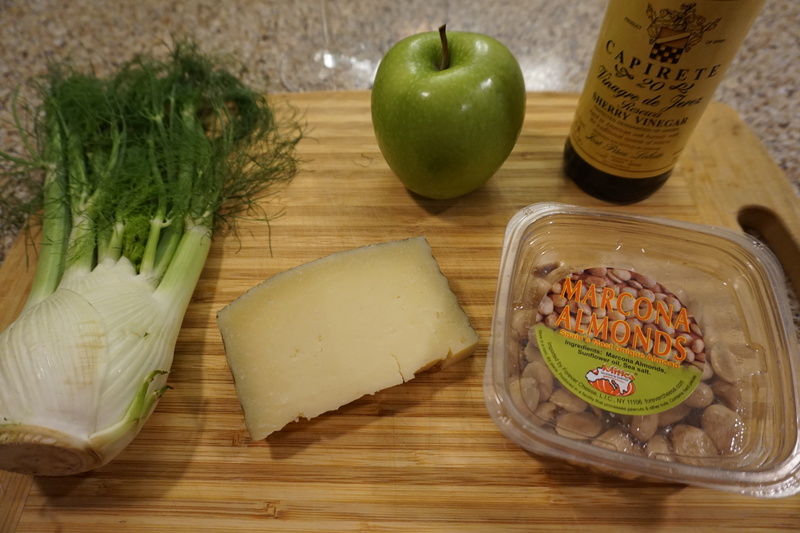 Raw apple is tossed with raw fennel, salty manchego cheese and nuts to create a great, crunchy fall salad. Experiment with different ways of cutting the elements of this salad – sometimes I do the apple, fennel and cheese all in baton shapes, sometimes I slice them thinly, and sometimes I do them in different shapes. The exact same ingredients take on a different personality depending on how you present them, from rustic to sophisticated. Hope you enjoy apple week! In a large bowl toss the fennel, apple and manchego together. In a smaller bowl crease a dressing by whisking together to the sherry vinegar, olive oil and salt and pepper. Toss the veggies with the dressing then spread out the salad on a nice platter. Sprinkle with the almonds and reserved chopped fennel fronds (the green leafy parts) and serve. 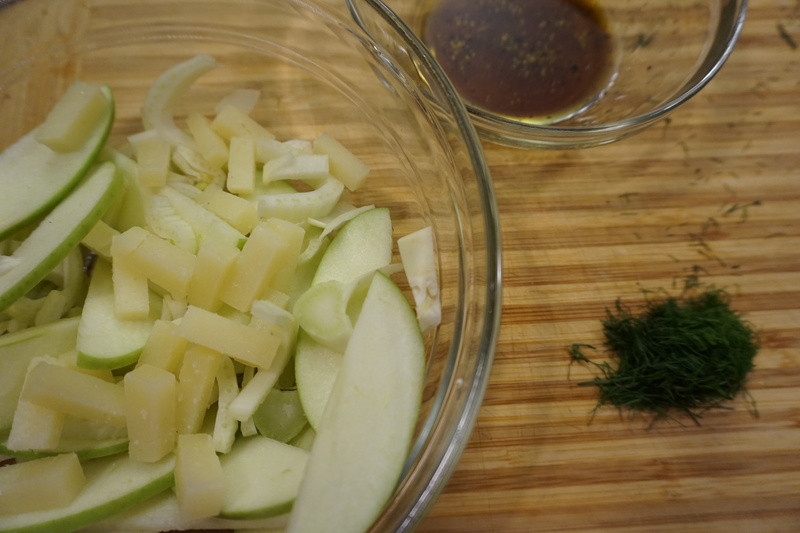 In a large bowl toss the fennel, apple and manchego together. In a smaller bowl crease a dressing by whisking together to the sherry vinegar, olive oil and salt and pepper. Toss the veggies with the dressing then spread out the salad on a nice platter. Sprinkle with the almonds and reserved chopped fennel fronds (the green leafy parts) and serve. I make this salad with some mustard and raisins. Must try the manchego. Sounds awesome! I love this salad with smoked Pork Cheeks! Verry tasteful! I will definitely make this salad this weekend. My niece who is on a low glycemic diet is visiting us in the country this weekend. This recipe fits the bill.